In this plate Vasi chooses not to show the obvious view of the façade of S. Maria in Aracoeli: maybe because Romans (at least those who know the city where they live) prefer reaching the church through the much easier approach of Piazza del Campidoglio, rather than climbing up the steep and dangerous steps which lead to the façade. The view is taken from the green dot in the 1748 map below. 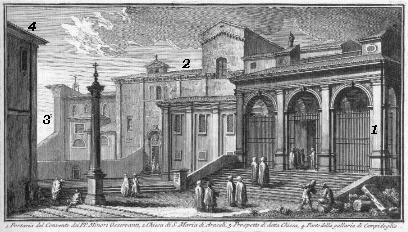 In the description below the plate Vasi made reference to: 1) Entrance to the Monastery; 2) S. Maria in Aracoeli; 3) Façade of the church; 4) Part of Palazzo Nuovo. 4) is shown in another page. 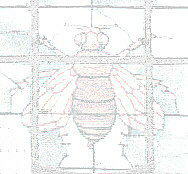 The small map shows also 5) S. Biagio in Mercatello. The church and the adjoining monastery show some minor changes such as the coat of arms of the Savelli, a reminder of Honorius IV's tomb inside the church. S. Maria in Aracoeli is very close to Palazzo Savelli. 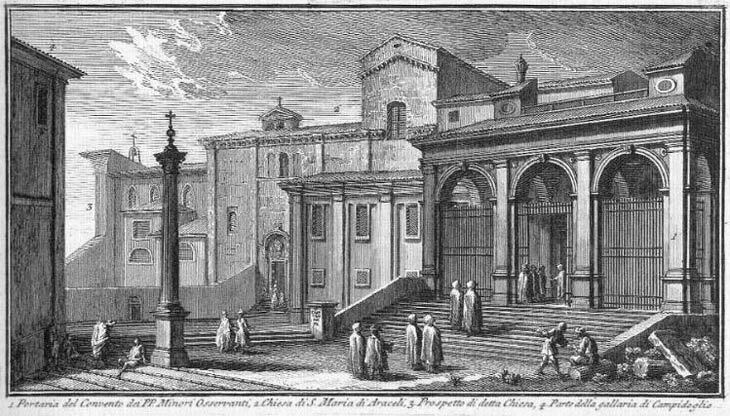 The loggia which gives access to the Franciscan monastery was built in the XVIth century by Paulus III as entrance to his summer residence, but it was transferred to the friars by Sistus V.
Vasi forces perspective laws to show the entrance to the church where the baroque decoration is today replaced by a XIIIth century mosaic. The western access to the church was built for the jubilee of the year 1350. The porch on the façade is not only interesting for the hand holding the arch, but also for the heraldic eagle of the Mattei, another important family having their Palace close to the church. 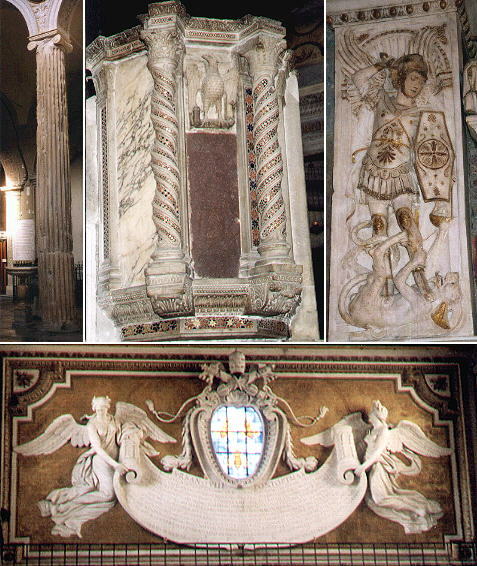 The interior of the church contains memories of various periods: the nave is borne by 22 different ancient columns; the pulpit is a fine XIIIth century work; on the left part of the inner façade the tomb of Cardinal Lebretto (d. 1465) has an extremely elegant Renaissance relief of St George by Andrea Bregno da Osteno and Gian Lorenzo Bernini designed in the inner façade a gigantic baroque coat of arms in honour of Urbanus VIII: the shape of the window was rearranged to be consistent with the traditional shape of a coat of arms so that the afternoon sun would light up the bees of the Barberini. In his 1761 guide of Rome, Giuseppe Vasi wrote that the church of SS. Venanzio e Ansovino was once known as S. Biagio in mercatello (mercatello being a reference to a fruit market held nearby). The excavations of the 1930s which led to the removal of the church of S. Rita at the foot of S. Maria in Aracoeli brought to light that S. Rita had been built using some structures of the old church dedicated to S. Biagio. This church in turn was built using in part the walls of a Roman insula a sort of five storey apartment block. While S. Rita was rebuilt near Piazza Montanara the apse and the small bell tower of S. Biagio were left at the top of the insula. Aris ergo de hinc tacitus abscedito nostris.' dalla cui risposta intimorito l'Imperatore inalzò nel tempio l'altare col suddetto titolo, e si crede che fosse eretto, ove ora vediamo nella crociata di questa chiesa l'altare isolato, che da Anacleto Antipapa nell'an. 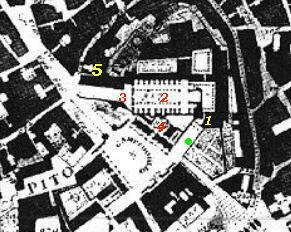 1130. fu ornato con 4. colonne di porfido, e poi nel 1603. dal Vescovo Cavalliense gli fu fatta la cupola con 8. colonne di marmo. Era quella gran chiesa una delle 20. Badie privilegiate di Roma, e la possedettero per molto tempo i Monaci di s. Benedetto: ma Innocenzo IV. nell'anno 1253. la concedè ai Frati di s. Francesco, i quali poi nel 1445. dividendosi tra Conventuali, ed Osservanti, Eugenio IV. la concedè a quest' ultimi. Il Card. Oliviero Caraffa la ristaurò l'anno 1464. e dipoi il Popolo Romano vi fece il nobilissimo soffitto dorato, per ringraziamento alla ss. Vergine della vittoria conseguita l'anno 1572. ai 20. di Ottobre dall' armata Cristiana contro i Turchi, perchè in questa sogliono pigliar possesso i nuovi Conservatori del Popolo Romano. Sono in questa chiesa varj depositi, e memorie antiche, e moltissime cappelle ornate di marmi, di sculture, e di pitture antiche, e moderne, fra le quali sono due quadri del Cav. Benesiani nella cappella di s. Margherita da Cortona, due del Muziano, due di Pasqualino, ed una Madonna nel coro de' frati, che si crede opera di Raffaelle da Urbino, gli altri si tralasciano per non più infastidire il Lettore; ma non già voglio omettere di indicare le pitture a fresco, che sono nel claustro di qualche merito, e l'iscrizione della terza colonna vicino alla porta della chiesa, in cui si legge A CUBICULO AUGUSTORUM.